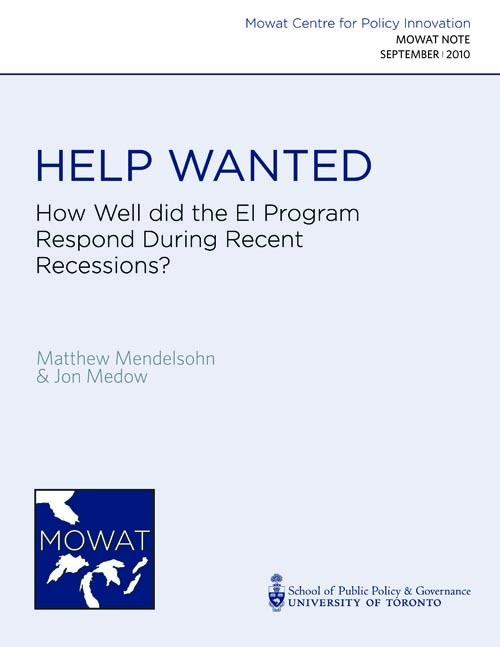 How Well did the EI Program Respond During Recent Recessions? This Mowat Note assesses how well Canada’s Employment Insurance system performed during the most recent recession compared to previous recessions, focusing on regional inequities. The goal is to reflect on the program’s effectiveness and fairness during periods when it is most needed. The analysis reveals that regional differences in coverage between provinces were significant. In Ontario and British Columbia in 2009, only 38 per cent and 39 per cent (respectively) of the unemployed were receiving benefits, while in some other provinces, over 90 per cent of the unemployed were receiving benefits. The Note documents that the system simply does not respond well to job losses in Ontario and parts of Western Canada. Something has broken down in the way the EI program works in the context of Canada’s current labour market. In turn, a broad re-think of the EI program and support for the unemployed that is sensitive to changes in the Canadian labour market is required. Recessions provide stress tests for existing social policies. They also provide opportunities to improve policies that are not working well or may not be fulfilling their original intentions. This Mowat Note assesses how well Canada’s Employment Insurance (EI) system performed during the most recent recession compared to previous recessions, focusing on regional inequities. The goal is to reflect on the program’s effectiveness and fairness during periods when it is most needed. In 2008-09, only 46 per cent of unemployed Canadians received EI benefits, compared with 71 per cent and 76 per cent in the recessions of 1981-82 and 1990-91. Regional differences in coverage between provinces were significant. In Ontario and British Columbia in 2009, only 38 per cent and 39 per cent respectively of the unemployed were receiving benefits, while in some other provinces, over 90 per cent of the unemployed were receiving benefits. Despite rising unemployment rates in Ontario and Western Canada during the past recession, Canadians in Ontario and the West were far less able to access EI benefits than Canadians in the five easternmost provinces. In fact, during the most recent recession Ontario’s unemployment rate was above the national average (it was the fourth highest in the country), but the percentage of Ontario’s unemployed that received EI benefits was lower than in any other province. The EI program is broken and does not work in the current labour market. This note documents that policy solutions do not lie in the past. Investing more money in the existing program or redistributing money from one region to another will only compound existing problems. Solutions must be found elsewhere. These new models of income support for the unemployed must acknowledge changes in the labour market and must work in tandem with the country’s entire suite of government programs, including training and provincial income assistance.